Introducing a limited time special offer for TENA™ range of products - 5% off when bought in packs of 3 of 4 and picked up in store. Special offer: 5% off the Plus and Super range when you buy 4 and pick up in store. TENA Pants Plus is a disposable pant for moderate to heavy bladder weakness, with a high absorption capacity than TENA Lady Protective Underwear. Highly effective, they look and feel like everyday underwear and are easy to put on and take off. TENA Pants Plus are designed for men and women experiencing moderate to heavy bladder weakness. They are white products with a Body-Close Fit™. They have side-seam openings for easy removal. Available in sizes: XS, S, M, L & XL. TENA Pants Super is a disposable pant for heavy bladder weakness, providing maximum security and comfort for men and women. Similar to TENA Pants Plus, but more absorbent, they look and feel like everyday underwear and are easy to put on and take off. TENA Pants Super are designed for men and women experiencing moderate to heavy bladder weakness. They are white products with a Body-Close Fit™. Available in sizes: S, M, L & XL. Special offer: 5% off the Plus and Super range when you buy 3 and pick up in store. 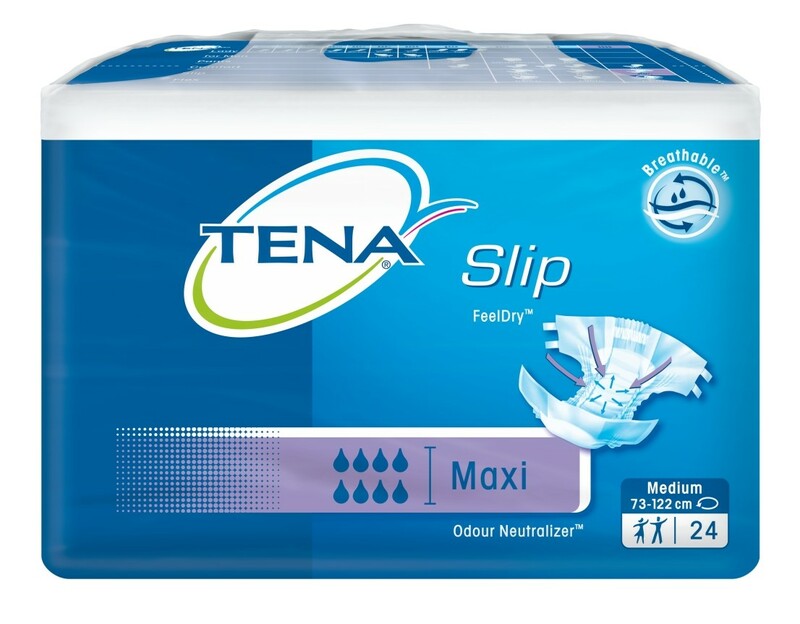 TENA Slip, are designed for men and women experiencing moderate to heavy bladder weakness. Tena white products with an Odour Neutralizer™ system which neutralises potential odours for increased confidence. Available in 3 levels of absorbency in sizes: XS, S, M, & L.
TENA Flex is a revolutionary belted protection which offers both the security and flexibility of an all-in-one system, and the comfort and discretion of a cloth-type product. The pad is held in place using the unique easy-fastening system that secures the pad to the belt. TENA Flex has a soft, breathable back-sheet and waist-belt, can be re-sealed, and is elasticated for a snug, secure fit. This product is easier to put on when the wearer is able to stand. TENA Flex, are designed for men and women experiencing moderate to heavy bladder weakness. Available in 3 levels of absorbency in sizes: S, M, L & XL. Special offer: 5% off all ranges when you buy 3 and pick up in store. TENA Comfort is a flexible and comfortable ‘shaped’ pad, for people who require a high absorbency product and wish to continue using pads. The absorption layer takes in urine rapidly, keeping the skin dry and the Odour Neutralizer™ system neutralises potential odours for increased confidence. The TENA Comfort pad is a 2-piece product which should be held in place with TENA Fix stretch pants. TENA Comfort and TENA Fix can be put on the wearer if they are standing up or lying down and are easy to fit and change. TENA Comfort & Fix products are designed for men and women experiencing moderate to heavy bladder weakness. Should be worn together as a 2-piece product. Available in 5 levels of absorption.